What Jobs Can Kids Get to Earn and Save Money? The best way for kids to learn about money is for them to have to manage some. When kids have money in their pocket, so they have the chance to buy things that they want to participate in fun activities with their friends, they end up learning about budgeting, needs vs. wants and so much more! As a parent, it can be frustrating that the only source of money is an allowance or doing chores around the house. It helps to have kids learn how to make money in ways other than from us. 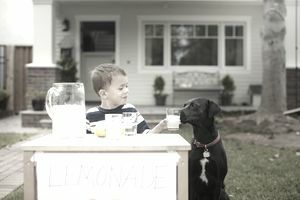 It’s a common idea for kids who want to make money, but a lemonade stand teaches kids basic lessons about entrepreneurship. Encourage the kids to make cookies, finger foods, or drinks that can be sold on the street corner. The kids will learn how to put in the work to make a product that can be sold, and they will get a little spending money when the neighbors stop to buy a treat. Common neighborhood services might include babysitting, house cleaning, lawn mowing, or car washing services. Help your child improve their services by learning good techniques to get the job done right. Also, help them put together flyers and price lists so that they have easy marketing materials when talking with people in the area. Many kids have too many toys, especially since they are always getting gifts on their birthday and during holidays. Plan a family garage sale, and let each child choose the items they would like to sell. Let them keep the money that is earned from selling their own items. A garage sale is beneficial to earn money, and you will also be able to de-clutter the house at the same time. Go to the mountains and pick mistletoe, and sell it during Christmas time. Make Valentine’s treats, such as chocolate truffles and heart-shaped cookies that can be sold as Valentine’s gifts. Sell hardboiled eggs and egg dye kits for families to enjoy the activity of dying Easter eggs without the hassle of all the preparation. Take orders a week before Thanksgiving, and offer a pie delivery service the morning of Thanksgiving. Find a local recycling company and ask how much they pay per pound. Have the child gather recyclable goods, such as newspapers, soda cans, or glass bottles, and take them to the recycling plant. Teach the kids how to make crafts, such as homemade jewelry or decorative signs for the home. Plan a family activity to make these items, and sell them at a local craft fair or on a website like Etsy.com. You might consider having the child involved in purchasing the supplies for the crafts, so they understand the value that goes into producing a product to sell. It is a really great one for kids who are already naturally artistic, teaching them early they can make money off their talents. This can help your child avoid the starving artist story! Many families travel during the summer, and they need pet care while they are gone. Offer pet care services to the neighbors, which teaches the child the responsibility that is needed to feed and care for the animals. You could even have them tack on plant watering for a bonus or a bit extra money! There are plenty of ways for kids to make extra money that does not come out of your pocket.